How to use OODA Loop to Power your Decisions? The OODA loop helps us process and respond to information coming at us very quickly. It is used when rapid, on the fly planning and decision are necessary. Developed by the late Air Force Colonel John Boyd to simplify the rapid-fire life and death decisions made during aerial combat. Boyd’s simple but very powerful conclusion was that any conflict was a time-based problem. Whichever side could move through their OODA loop the fastest would have the upper hand. This is tricky. Observe our situation closely. What is our relative position to the enemy, and how is their behavior going to impact us? Observation and situational awareness are skills that the SEALs spend a lot of time developing. The “Keep in Memory” game helps individual operators and team gather a lot of information quickly and accurately. Expanding our sensory awareness field to take in more information at a subconscious level is another valuable Observation skill. The SEAL sniper team observes an enemy sniper taking a bead on a US Army convoy approaching from the West. Orient ourselves to the reality of our observation as fast as possible without making too risky or risk-averse moves. Orientation is the processing and analyzing of the observed information. This is where it is helpful to ensure that the biases and tendencies do not drive poor analysis. The SEAL sniper team orients themselves to the new information – they are not in a good position to take an effective shot at the enemy sniper, but don’t have time to move clandestinely to a new position. They are under pressure to take some action immediately or the enemy sniper will certainly get a few shots off with obvious implications to the oncoming US force. Decide on a course of action. This is where the rubber meets the road. Depending on the complexity and stakes involved, this can be a simple choice or a complex decision after analyzing multiple courses of action. The sniper team decides to expose themselves and run like hell to a new position. They are aware that the action is high risk to them, but after processing it through their OODA loop this decision made the most sense. Not only would it interrupt the pending shot by alerting the enemy sniper as to their presence, but it will put them in a better position to take out the sniper should he remain in his position. Act! Nothing happens until the action takes place. The sniper team moves out. The enemy sniper is alerted and high-tails it to a new location. The oncoming convoy is spared…the cat and mouse OODA loop game continues. 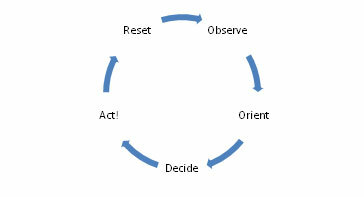 The OODA loop requires time sensitive planning – planning on the fly. One reason SEALs are so effective at accomplishing complex and dangerous missions is that they use OODA loop and a time sensitive planning process. They don’t plan something to death, rather prefer to get busy and shorten their OODA cycle whilst seeking to outright sever the OODA loop of their enemies. I wanted to let you know that your UMA program is AWEsome. I am about 3 weeks into the second lesson, I’ve read all the materials a few times, doing Yoga & guided visualization meditations most mornings. Working towards a Korkoro camp, hopefully this June. Did a “modified” Murph this Saturday: 2.5 mile run, 75 pullups (most were not dead-hang starts), 150 pushups, 300 squats, then another 2.5 mile run. Your stuff requires a lot more upper body than what I am used to for cycling and tri’s so working to build that up. Shooting to have the full Murph within 2 weeks, also going to check out joining a local Crossfit called TeamElite. In short, I’m “all-in.” Overall, I believe that the course has notably improved my mental toughness at work in many dimensions – and these days it seems to take a lot of toughness! I am also excited to announce the new Unbeatable Mind Live Academy, to debut November 20 – 26, 2012. This one week live in academy covers the Unbeatable Mind philosophy and introduces you to the mental and awareness practices of the program. Each day includes a morning practice, Warrior Yoga pose clinic, mental toughness and awareness skill sessions, contemplation time, meditation and visualization practice. This is a practitioner training, NOT a teachers training and no prior yoga experience is required. As mentioned this Academy does NOT require a high degree of physical fitness like the Kokoro Camp or SEALFIT Academy. It will, however, give you the tools to develop yourself physically, mentally, emotionally, and spiritually. Combine exercises from these intense FitDeck titles to create unforgettable and challenging sequences of exercises. Includes: FitDeck Bodyweight, FitDeck Navy SEAL, FitDeck Combat Sports, FitDeck Firefighter, FitDeck CrossTrai,n FitDeck Core Blast and 1 neoprene sleeve. 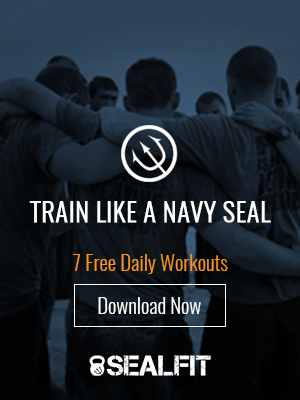 Purchase this quality product at NavySEALs.com.